How Can I Learn to Swim by Myself? The shallow end of a swimming pool is a good place to learn to swim by yourself. Swimming involves breathing, kicking with your legs and stroking with your arms. These are things you can practice one at a time in shallow water. Possibly the simplest stroke for a beginner is the forward crawl. Once you understand how to propel yourself across the top of the water, you can practice and learn other strokes. Stand with your back against the end of the pool, take a breath and bend forward at the waist until your face is completely in the water. Your ears should be at the water line. Hold this position for two seconds, slowly turn your head to one side and exhale into the water as you do. Return to a standing position. Hold your arms out from your side, palms down with your fingers together. Take a breath and bend forward as before. With your face in the water, bring your right arm up and out of the water, and reach in front of yourself. When your hand contacts the water, pull your arm straight down and make a circular motion underwater until your hand is behind you and at your right side. Your palm should be up at this point. Turn your head to the right and draw a new breath through your mouth without lifting your head. Turn your head back and exhale with your face in the water. Repeat the stroke and breathing exercise until you are able to make a stroke with each arm and one complete breath without lifting your head out of the water. Looping or irregular strokes underwater will cause you to work harder in order to cover the same distance when your swimming. The arms propel the front of your body and kicking your legs will prevent your torso from sinking. Face the side of the pool and place both hands on the edge. Extend your arms, lift both legs together until your arms, body and legs are in a straight line away from the edge. Turn your head to one side and draw a breath through your mouth. Do not lift your head straight up. Hold your knees straight and kick your legs from the hip. Kick relatively fast and make the smallest splashes possible. Your feet should not come out of the water. Exhale underwater, turn your head and draw a new breath. Continue your kicks and breathing until you are comfortable breathing while kicking. Stand with your back to the side of the pool, facing across the shallow end to the opposite side. Bend at the knees, extend your left arm in front, take a breath and push away from the side with your legs. As you move away from the side, your face should go in the water and your legs should begin to kick as you take a forward stroke with your right arm. Continue kicking as you make concentrated strokes, bringing each hand back until the palm is at your side as you reach ahead to stroke with the other arm. Make two strokes with each arm, turn your head and draw a breath, return your head to straight and continue. Practice this until you feel comfortable with the breathing and you are able to swim the width of the pool without having to stop. 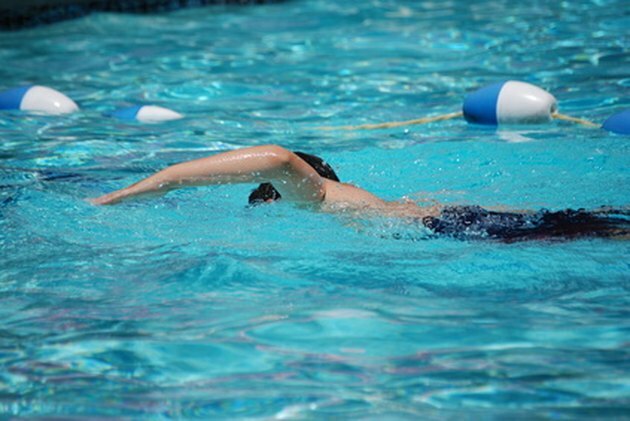 Bringing your arms out of the water and reaching ahead a flat circular motion rather than overhead can save energy. Organized workouts are best. Practice each phase for 10 minutes a day until you are able to combine strokes, kicks and breathing. Do not attempt to swim in deep water without supervision. It takes time to get in swimming shape. Do not practice when you are tired.